"Holland, the world is ours." If you're a fan of the Ealing Studios comedies, you're probably keenly aware that even when they're not at their best, they're still very, very good. The Lavender Hill Mob isn't filmmaking of the highest order, but it's a pretty entertaining bit of work, highlighted by two most winning performances by its leading men. Alec Guinness plays Holland, a seemingly mild-mannered sort who has been waiting nearly twenty years for his big score—he works for a London bank as the supervisor of the transport of gold bullion, and under his watch millions of pounds worth of gold are transported every day. He's made himself such a fuddy-duddy that he's become a joke at the office, and after all these years he's close to morphing into nothing more than the role he's been playing. How can he take advantage of his access, and make off with more than his share of riches? Inspiration comes from the new boarder at the rooming house in which he lives, a garrulous fellow named Pendlebury, played by Stanley Holloway, perhaps best known in the U.S. as Eliza's father in My Fair Lady. (Their home is in the Lavender Hill neighborhood of London; hence the film's title.) Pendlebury is in the tchatchke business, essentially—he heads a company that makes little knickknacks for sale at tourist destinations throughout Europe, so if it's, say, a cookie jar in the shape of Anne Hathaway's house that you simply must have or bring home to auntie, Pendlebury is your man. Holland rallies Pendlebury to the cause, and there's more than enough larceny in each of their hearts: after hijacking the van carrying a load of bullion, a future shipment of Pendlebury's model Eiffel Towers will be made not of lead but of gold. They'll leave Britain crated up as souvenirs, and the men will gather them up in Paris, a fortune recast in gewgaws. Charles Crichton directs with panache—his renaissance in Hollywood came decades later, with A Fish Called Wanda—but it's not the most tightly told story. The boys pretty arbitrarily get a pair of hardened thieves (Sidney James and Alfie Bass) to join their mob, and just as randomly get rid of them; you may be waiting for the old double-cross, but it never happens. And of course things go awry with their plot; they always do, and while Holland and Pendlebury are pretty swift, they aren't necessarily the brightest lights on the Christmas tree. (Their big fallback plan: Run!) One of the difficulties of looking back at this movie is taking into account its obvious enormous influence, as it sowed the seeds for such later caper pictures as Ocean's Eleven, Topkapi, The Thomas Crown Affair and Heist; we may have been hardened collectively as an audience by so many twists and turns, so what's here seems pretty basic. But Guinness and Holloway are wonderful. Both are lightning quick with witticisms and are gifted physical comedians, and with Holloway's bombast and Guinness's primping, they're a comedy team on par with Laurel and Hardy or Abbott and Costello. The framing story, with Holland in South America, is more than a little reminiscent of the one used in Preston Sturges's The Great McGinty, but it's especially notable for a lovely young thing who greets Holland—it's an early and very brief performance by a young Audrey Hepburn. Image Transfer Review: The transfer doesn't look nearly as good as does the one for The Man in the White Suit, made by the same studio in the same year; such are the vagaries of the DVD business, I suppose. A fair amount of scratches interfere with video quality, and the deep-focus shots look particularly shoddy. The chase sequences seem to have been shot routinely against matte backgrounds, and they don't look very good; I doubt they ever did, but they haven't worn well with the years, that's for sure. The image quality is far superior when the production was limited to the Ealing confines. Audio Transfer Review: The mono track gets muffled from time to time; some of this must have to do with the limitations of the production, but when there's a lot happening on screen�three or four characters each up to some noisy bit of business, say�it's a strain to make out the dialogue. Some ambient noise at a high level interferes with some regularity, too. Extras Review: As with the other titles in this Guinness series, the only extras are an original trailer and a biography and selected filmography for Sir Alec. 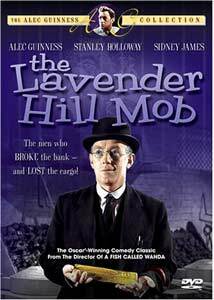 A good romping bit of fun, though it may not bowl you over with its hilarity, The Lavender Hill Mob is charming and worthy of a look.